Nguyen My Ha reports from the scene of the Dien Bien Phu battle, 60 years later. Filled with scenic landscapes and country-style food, her road trip also offered insight into the momentous historic occasion. With "The road to the Northwest is so long and winding" tune humming in my head, we leave Ha Noi in early last Sunday morning for a truly soul-searching trip. Spring in Ha Noi is particularly wet as humidity can reach more than 90 per cent and the country roads can get rather muddy. With the 60th anniversary of the Dien Bien Phu Battle soon approaching, I realise that since we live in peaceful times today, it is quite difficult for the people of our generation to understand the importance of the battle that took place before we were born. As we were preparing for the long trip from Ha Noi to the former battlefield, a distance of nearly 500km that had to be covered in a day, music was our only solace. After listening to almost all genres of Vietnamese music, from sweet melodies of romantic music to upbeat revolutionary songs, we realised that the happy tunes from the war-of-resistance years were the best to make the voyage more enjoyable and shorter than it was. "I have travelled this road many times. My father was also a lorry driver and I used to go to his friend's house during summer holidays. 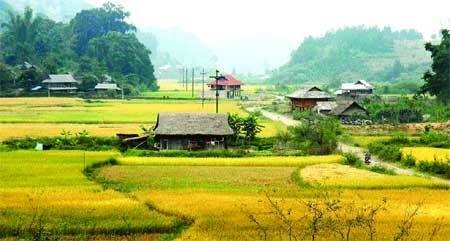 I'm positive that we'll reach Dien Bien before dawn," our driver assured us. Dien Bien Phu, now a city of nearly half a million people, comprising the Thai (38 per cent), the Mong (30 per cent), and the Kinh (20 per cent), is world renowned for being the theatre of a long battle in which General Vo Nguyen Giap led a young Vietnamese army to victory over much better-equipped, and well trained French expeditionary army. It does make a difference when you travel with someone who is well-versed with the road. Driver Nguyen Quang Hiep suggested that we stop at Cao Phong, a hilly farm region famous for its oranges. Small shops along the road sell oranges. The prices are fixed and the fruit is juicy, though not very sweet. This is a good season to venture up into the northwestern mountains as hot westernly winds blow from northern Laos. By 10.30am, we could discern a change in the weather. The thick misty curtain that had limited our vision was getting thinner, and by the time we reached Mai Chau, the sky was clear and the sun was shining. Groups of college students on motorbikes had stopped at the top of a pass overlooking a Thai hamlet in Mai Chau. Along the road from Ha Noi to Dien Bien, we saw groups of people on motorbikes and even bicycles going up and down the mountains. A friend of mine, who has, for many years, lived and travelled across the northern mountains from west to east stated that there is nothing like going downhill on a motorbike with your girlfriend on the back seat and what we witnessed along the road proved his words. Youngsters, travelling in groups of six to ten, happily stop at popular scenic spots and take photographs which they upload on their Facebook right then and there. You cannot report news any sooner than that. Along the roads, there are only two stops where one can halt for meals: Moc Chau, or Son La. This time we went all the way to Son La, at 1pm for lunch. Restaurant 559 by the town's stadium was a good suggestion as the food was fresh and we weren't looking for any rare forest meat. The simple meal comprised stir-fried beef with vegetables, fried eggs, sauteed chicken with ginger, and a wonderful crab with vegetable soup. One of our main concerns before the trip was to tell our driver to avoid consuming alcohol with meals on the way. It is banned practice but often skirted by drivers travelling long distances to drink either beer or rice liquor with their meals. Recent reports suggest that drinking has become a major problem in Vietnamese society, with people spending US$3 billion on alcohol. After lunch, we headed uphill through scenic mountainous slopes. The north and south of Viet Nam, divided by the Hoanh Son Mountain Range, are characterised by distinctly different types of weather: the north has four distinct seasons, while the south has only two, dry and rainy seasons. To my sheer surprise, the Lai Chau Province, particularly Dien Bien Phu, also has only two seasons: the rainy season lasting from May to October and the dry season for the rest of the year. The dry season has its own unique charm. I've never seen such beautiful arable hills where people plough in lines, winding between big trees. Varying shades of yellow, from light to dirt yellow and reddish blocks with green dots, reminded me of a giant quilt, carefully sewn by a grandmother for a newly born baby. 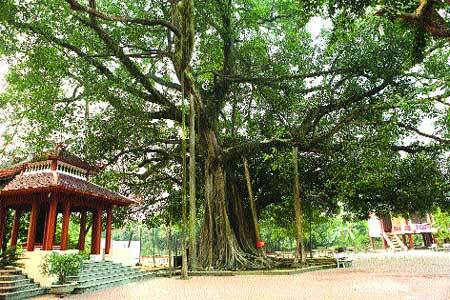 I actually do not like the all-green shade of spring while travelling to the regions around Ha Noi. The colours of a dying season add a touch of diversity and are suggestive of new birth. Standing at the top of a high pass, peering down the Dien Bien Phu valley, we wondered how the Vietnamese soldiers managed to pull artillery uphill all the way from the foot of the mountains, with their bare hands, without any machines. And they sang as they did so. We finally arrived in Dien Bien at 6pm, before dusk, as the driver had promised. The drive downhill was rough as we all got carsick and needed to rest the next day. If one is interested in history and would like to visit an old battlefield, Dien Bien makes for a perfect destination. All the places associated with the battle can still be seen. 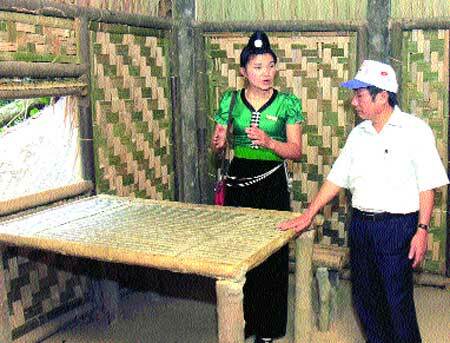 However, as the trenches and thatched huts were built from bamboo, wood, and straw during the battle period, it can be quite challenging to keep them intact and in their original condition. The roofing and wood have been strengthened with cement, which makes it easier to maintain in the rainy weather. This season, the beautiful ban flowers, the symbol of Dien Bien, are in full bloom and the most splendid ones can be seen in the Memorial House for General Vo Nguyen Giap in Muong Phang, 30km from Dien Bien Phu battlefield, on a well-maintained uphill road. In Muong Phang, after visiting the General Giap commanding headquarters and the Chinese advisors trench, one can stop for a boat ride in the nearby Pa Khoang Lake. Scenic beauty with tranquil waters and a bright red sun slowed our descent down the hill and provided us a perfect end to the day.